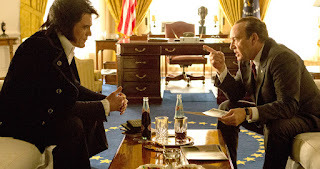 The subtlest humor to come from Elvis and Nixon isn't its relaxed pace and “one – joke - ee – ness,” but something else that quietly comes to mind as this new movie slips through your brain. It's almost a spoiler, but not quite. If Kevin Spacey playing Richard Milhous Nixon doesn't put you into at least a reasonably chaotic fit of laughter, there's no hope that you’ll enjoy this more than slightly exaggerated take on US presidential history of the Seventies. And should you be unaffected by the most talented Michael Shannon doing his sour and understated reading of Elvis Aaron Presley, you'd do better watching a cable rerun of Viva Las Vegas or Jailhouse Rock. Otherwise, you're in good hands with Liza Jackson, the director of a picture that magnifies the moment just a few days before Christmas in 1970 when Elvis lobbies to become a one-of-a-kind secret agent for the Nixon Administration in order to bring an end to the spread of Communism in America and insure the nation's younger people just stop smoking all that damn weed. All Elvis ever wanted in return was a badge to prove his governmental stealth. What a diamond-studded patriot he was. Merely getting through White House security takes up much of the picture. It’s during this sequence we get re-acquainted (if you’re old enough) to White House staffers who made The King’s access to the oval-shaped room not an easy thing. The names of these individuals are ingrained in the history of the Watergate Era: Egil Krogh (Colin Hanks), Dwight Chapin (Evan Peters) and H. R. Haldeman (Tate Donovan). After going through all the machinations and protocol pondering whether Elvis may or may not talk with Nixon face-to-face, the 37th president of the United States of America agrees to give Elvis a scant five minutes. Really funny stuff happens and lasts much more than just five minutes. Once within the Oval Office, Elvis and Nixon play that game of conversation well known to highly visible males with immense power over their fans and, in Nixon’s case, detractors. Forced pleasantries and awkward moments fly by. Elvis does drink the President’s Dr. Pepper on the coffee table and gnaws at some of Nixon’s M & M’s which the popular music star and film idol has been privately advised before hand by Mr. Krogh not to do. It gets “worse.” And Kevin Spacey gets better. Well, Spacey’s been more than better from the beginning of the film. It just seems better, because the predicament becomes even more absurd as Nixon’s character seems to get a bit overwhelmed by Presley’s gall in the heady and important atmosphere of the Oval Office. Spacey and Shannon play their roles wisely: Spacey, a bit broader than you’d expect the real Nixon to be, and Shannon treading lightly as the illustrious Elvis. The movie would have been a “sad” affair had Shannon not presented in slightly muted tones with his disgruntled but determined approach to becoming a special undercover agent for the Bureau of Narcotics and Dangerous Drugs. Thinking about Mr. Presley’s unfortunate and untimely demise in 1977 gives this aspect of the story a quiet irony, I believe. An aside stretch of humor has to do with Elvis’s penchant for packing heat. The singer is --- shall I say --- loaded for bear on his person and even with the gift he’s brought to the White House to leave with Mr. Nixon. National Rifle Association members are sure to bath in the delight of Elvis’s amore for concealed arms --- and their use. Nevada rancher, Cliven Bundy would be proud. I have to say, Elvis And Nixon isn’t quite as funny as I thought it would be. (My personal sense of the political may be at play here.) But the movie is terrific entertainment. It brought me to thinking that if the real Richard Nixon was still with us, he’d probably be upset that the title didn’t give him top billing.